Canadian Prime Minister Justin Trudeau attended a State dinner at Dublin Castle tonight hosted by Taoiseach Leo Varadkar. Mr Trudeau and the Taoiseach earlier reaffirmed their commitment to the trade agreement between the EU and Canada at their meeting in Farmleigh House. The Canadian prime minister is the Taoiseach's first international visitor and today was their first meeting. Mr Varadkar said CETA - EU-Canada Comprehensive Economic and Trade Economic - had more upsides than downsides and both Ireland and Canada were committed to free trade. He said it will deliver stronger economic growth and create more well-paid jobs on both sides of the Atlantic and said Canada is looking forward to the agreement coming into force. He also said that he encouraged the Taoiseach to get more women to run for political office. Mr Trudeau has an equal number of women and men in his cabinet. Mr Varadkar said it is up to others to decide if he is a feminist or not, but he is committed to getting more women elected and on those grounds would consider himself a feminist. Both leaders spoke about the benefits of migration and said countries do best when open to the world. Mr Varadkar said both Ireland and Canada had neighbours who were going in different directions. The visit comes ahead of a G20 summit in Germany, where a Canada-EU trade deal and Brexit will be high on the agenda. The Taoiseach has said previously that he admired the style and substance of Mr Trudeau. He has hailed both Mr Trudeau and French President Emmanuel Macron’s approach saying they have stood up for free trade and stood up for Europe. Mr Trudeau said both Canadian and Irish citizens "want to leave to our children and grandchildren a better world than the one we inherited from our parents, a cleaner more prosperous one where every person has a real and fair chance at success". 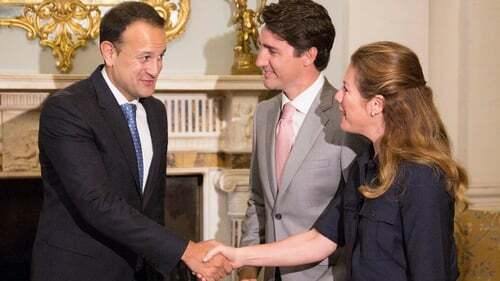 He added that Ireland and Canada share commitments to diversity, which is said is a source of strength and not weakness – "it’s not simply enough to tolerate our neighbours, we need to embrace the things that make each of us unique, whether it’s our gender, the language we speak at home where we worship or whom we love". He said Irish-Canadians helped make Canada the place it is today. Mr Trudeau also spoke ahead of his visit to the Famine Memorial and noted that its sister memorial is in Ireland Park on the shores of Lake Ontario. Mr Varadkar said they had a good meeting this morning and spoke of the shared interests between the two countries. He said both countries are committed to multilateralism and free trade and re-committed themselves to implementing CETA. Mr Trudeau also met President Michael D Higgins at Áras an Uachtarain before this evening's dinner at Dublin Castle.